Fugitive posts message on Facebook, Wash. man on the run finds time to update Facebook, A convicted felon manages to refresh his social media page while running from Wash. state police. 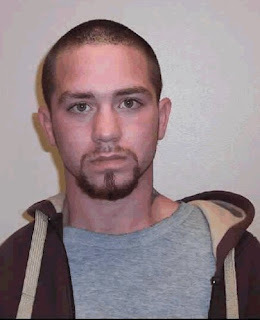 Wash. man on the run from police finds time to update Facebook page: 'got away thanks bro'. He's on the lam, but Travis A. Nicolaysen still had time to update his Facebook page. The 26-year-old has eluded authorities since two foot chases Wednesday and a dragnet that included a police dog tracking him through a Port Angeles neighborhood. The dog came up only with a blue bandanna he had been wearing. His first day on the run, one friend posted to his account: "Cops all over you." Nicolaysen responded the next day with: "ya got away thanks bro." A post from another friend told him to be careful. Another urged him to surrender and set a better example for his children. "You're not getting any younger and you're looking at a lot of time," the friend writes. A picture on the Facebook page shows Nicolaysen with two toddlers. Nicolaysen has been convicted of five felonies, including domestic violence, burglary and theft of a firearm, police said. He is wanted by the Washington state Department of Corrections for failing to check in with his community corrections officer since January. He's also accused of assaulting his girlfriend on March 28, police said. Better make that his ex-girlfriend. In a post Saturday, Nicolaysen changed his relationship status to single, the Peninsula Daily News reported (http://is.gd/dpnPtm ). Police are among those checking the page. "Absolutely," Deputy Chief Brian Smith told The Associated Press on Monday. "We're used to pinging databases and sources of information," he said. "It's normal for us to look at Facebook accounts." Smith also saw the growing number of comments on Nicolaysen's account — some of them mocking police — as he remained at large Monday. "I don't think it's going to make it any easier for him," Smith said. A lot of people communicate openly and can remain beyond the long arm of the law, at least for a while, he said. Facebook tells its users that it may share certain information if it gets requests from law enforcement, and that it does have some ability to track people via IP addresses and GPS location. Serving Facebook with a search warrant is a possibility, but there are no immediate plans for that, Smith said. For now, police hope the publicity alone may be enough to flush him out in a city the size of Port Angeles, population 19,000, on the Olympic Peninsula about 65 miles northwest of Seattle. "In a smaller community, it's harder to disappear and be anonymous," Smith said. "We're hoping people who know him call police." "People are giving him advice" to surrender, Smith said, "and he might want to follow it." While police find the fugitive Facebook posting a little frustrating, it's a source of glee for Teri Newell of Port Angeles who says she helped raise Nicolaysen and describes herself as his aunt. "I think it's hilarious," said Newell, who confirmed the Facebook account belonged to Nicolaysen. "That's my boy, Travis," she said. "Every single time he gets out of jail, he doesn't check in," said Newell, who also complains that police are heavy-handed. She said she doesn't know where he is. "If he's smart, he's hidden away, tucked away safe," she said. Port Angeles attorney Robert Vienneau, who says he knows Nicolaysen, says the fugitive does what he has to do to get by. "Travis comes from a rough background, but he's got a good heart," Vienneau said. An email to Nicolaysen from The Associated Press bounced back.